Colorado spruce (also called blue spruce) is a pyramidal conifer native to Colorado and the central Rocky Mountains. It has been extensively planted across Nebraska in shelterbelts and landscapes and is one of the most common evergreens in communities, especially in central and western Nebraska. Colorado spruce prefers average, moist, well-drained soils in full sun. It can tolerate some light shade and can tolerate moderate drought once established. Soils should be kept consistently moist the first season or two after planting. The tree can struggle in over-irrigated lawns, especially in heavy clay soil. When planted in the open, it should be placed in groups with other spruce or other evergreens. It makes a handsome ornamental tree for residential properties, however it should be properly sited and given plenty of room to grow. Many houses have been engulfed by little spruce trees planted near the front door which grew bigger than anticipated. Colorado spruce is a medium to large, pyramidal conifer with horizontal branching to the ground. It typically grows 40-70’ tall in cultivation, but may reach 100’ or more where it grows naturally. It is native to the central Rocky Mountains especially concentrated in Colorado and Utah where it is typically found growing in moist locations from 6000 to 11000 feet in elevation. Some trees have been dated to over 500 years old. The stiff, bristly, square, green to blue-green needles (to 1.5” long) point outward from the branches in all directions. Cylindrical light brown cones are about 4” long and have flexible scales. Dark gray bark furrows on mature trees. Needle color can be quite variable and trees with blue or silver blue foliage are generally more coveted for landscape use, thus the common name “blue spruce”. Numerous cultivars have been developed over the years and have been selected for both color and shape, with some trees being very narrow and upright and others fat and squatty. Some dwarf, shrubby forms have also been developed. 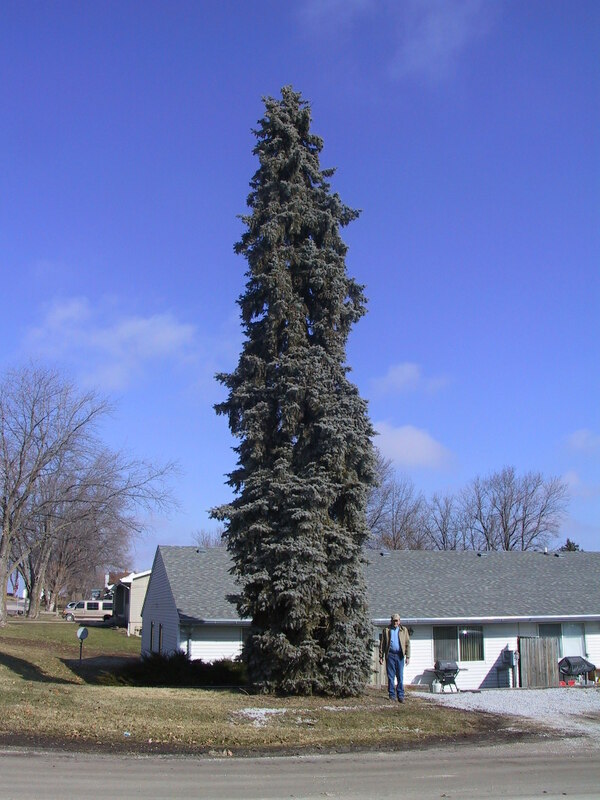 Blue spruce provides shelter for a variety of bird and animal species. Big game forage is common throughout its natural range and numerous birds eat the seeds. Blue spruce has been little used for lumber or wood products because it is rarely abundant in nature and the wood is brittle and often full of knots. Colorado spruce is susceptible to needle cast, canker, rust, aphids (particularly spruce gall aphids), scale and budworms. Bagworms and spider mite invasions can cause significant problems with new growth and overall tree health. The species can also suffer from high humidity in the eastern part of Nebraska. As our climate becomes generally warmer, it’s anticipated that several evergreen species, including Colorado spruce, will become more difficult to grow in Nebraska. Engelmann Spruce (Picea engelmannii) is a high-elevation spruce native to the Rockies from New Mexico into Canada. It is often associated with Colorado spruce and has a similar blue-green color. However, it is generally slower growing, more narrow and not as tall, likely reaching 30-40’ tall by 15-20’ wide. It is occasionally planted by collectors and in arboretums in Nebraska but is much less tolerant of the Great Plains environment. Meyer Spruce (Picea meyeri) is native to China and has a similar appearance to Colorado spruce with attractive blue-green foliage and a dense pyramidal habit. It is drought tolerant when established, adaptable to urban conditions and more tolerant of heat and humidity than Colorado spruce. Will likely grow 30-50’ tall x 25-35’ wide. The genus name Picea is reportedly derived from the Latin word pix meaning pitch in reference to the sticky resin typically found in spruce bark. The species name pungens means sharp-pointed in reference to the needles. Native Americans used an infusion of the needles to treat colds and settle the stomach. Early people used the wood for building.